Children born with craniofacial disorders affecting the growth of the jaw may benefit from a technique called mandibular bone lengthening, or distraction osteogenesis. This technique was first used by Dr. Ilizarov of Russia to treat bone problems in the leg, and has now been used successfully to correct deformities of the jaw. Some of the patients who may be able to benefit from this procedure are those with hemifacial microsomia, Treacher Collins Syndrome or other conditions affecting the jaw. Special x-rays are done to determine if a child will be a candidate for the device. Craniosynostosis is a term that refers to the early closing of one or more of the sutures of an infant’s head. The skull is normally composed of bones which are separated by sutures. This diagram shows the different sutures which can be involved. As an infant’s brain grows, open sutures allow the skull to expand and develop a relatively normal head shape. If one or more of the sutures has closed early, it causes the skull to expand in the direction of the open sutures. This can result in an abnormal head shape. In severe cases, this condition can also cause increased pressure on the growing brain. In sagittal synostosis (scaphocephaly), the sagittal suture is closed. As a result, the infant’s head does not expand in width but grows long and narrow to accommodate the growing brain. The sagittal suture is the most common single suture involved in craniosynostosis. The incidence of sagittal synostosis in the population is approximately 1 in 4200 births. Males are affected about three times as often as females. When the metopic suture is closed, this condition is called metopic synostosis. You may also hear the term trigonocephaly used to describe your child’s head shape. The deformity can vary from mild to severe. There is usually a ridge down the forehead that can be seen or felt and the eyebrows may appear “pinched” on either side. The eyes may also appear close together. The coronal suture goes from ear to ear on the top of the head. Early closure of one side, unilateral coronal synostosis (plagiocephaly) results in the forehead and orbital rim (eyebrow) having a flattened appearance on that side. This gives a “winking” effect. These features may also be more apparent when looking at the child in the mirror. 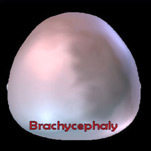 Both sides are fused in bicoronal synostosis (brachycephaly). In these cases, the child may have a very flat, recessed forehead. This suture fusion is most often found in Crouzon and Apert Syndromes. There are several clues that may have caused you or your doctor to suspect that your child has craniosynostosis. A misshapen head is usually the first clue. The anterior fontanelle, or soft spot, may or may not be open. The suspected diagnosis is confirmed by x-rays. A CT scan is also done to make sure there are no underlying abnormalities in the brain. Crouzon and Apert syndromes are the most common of the craniosynostosis syndromes. Craniosynostosis refers to the early closing of one or more of the sutures of an infant’s head. The coronal suture goes from ear to ear on the top of the head and fusion of both sides (bicoronal synostosis or brachycephaly) results in a very flat, recessed forehead. This is the suture fusion found most often in Crouzon and Apert syndromes. In addition to craniosynostosis these children also have fusion of the sutures or bones in the cranial base and midface, and shallow eye sockets. This gives the appearance of a flat midface and eyes which protrude. In addition, children with Apert syndrome have syndactaly (webbing) of the hands and feet. Crouzon syndrome occurs in approximately 1 in 25,000 births. It may be transmitted as an autosomal dominant genetic condition or appear as a fresh mutation (no affected parents). The appearance of an infant with Crouzons can vary in severity from a mild presentation with subtle midface characteristics to severe forms with multiple cranial sutures fused and marked midface and eye problems. The incidence of Apert syndrome is approximately 1 in 100,000 births and most cases are fresh mutations. The general features of a child with Apert syndrome are similar to those in Crouzon syndrome, however there is not as much variability between cases and the degree of presentation is more severe. Deformational plagiocephaly refers to a baby’s head that is crooked or asymmetrically shaped due to repeated pressures on the same areas of the head. The bones are very soft in an infant’s skull so the bones are easily misshapen if constant pressures are applied to the same spots of the skull. In Greek, “Plagio” means oblique and “cephaly” means head, thus “oblique head”. View an interview with Dr. Hobar and learn more about Deformational Plagiocephaly. 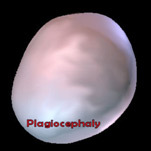 Deformational Plagiocephaly: back of head may have flattening on either side, possible shift of ear on same side that is flat, possible shift of forehead on same side that is flat; may be associated with facial asymmetry as well. 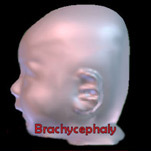 Deformational Brachycephaly: back of head is flat on both sides, may look even or uneven; head may be wide or bulging at the area of the ears and look tall from the side view. Deformational Scaphocephaly: head is typically flattened on both sides, with long narrow appearance, more common in premature babies. Torticollis: tightening of one or both of the main neck muscles which causes the baby to turn and/or tilt the head in one position, which in turn causes flattening of the same side of the head. Torticollis is often associated with deformational plagiocephaly since the baby cannot comfortably lie in all positions. Treatment with Physical Therapy and a home exercise program as soon as possible is usually necessary. Prematurity: the skull bones are softer in a premature infant, therefore prolonged, frequent positioning on one side may lead to asymmetry. Many extremely premature infants spend extended periods of time in the NICU on ventilators, which increases the risk for deformational plagiocephaly. Multiple births: may cause a tight intrauterine environment, causing pressure on the skull resulting in asymmetry. Intrauterine pressure/restrictive uterine environment: may be due to the maternal pelvis condition, large baby, or unusual position in uterus. Sleeping position: positioning the baby’s head in the same manner against a mattress or firm surface for a long period of time may cause flattening of the skull bones. There has been a dramatic increase in the number of infants with flattened heads since the American Academy of Pediatrics started the “Back to Sleep Campaign” in 1992. It is important that parents/caretakers frequently change the infants’ sleeping position so the baby does not always turn their head to the same side. Tummy time while awake and supervised is important to begin at a few weeks of age as well. Overuse of infant seats, carriers, swings: these devices are nice for occasional use but please do not substitute them for your baby’s sleeping area as there is no room for natural movement, thus putting your baby at risk for the development of deformational plagiocephaly. How is deformational plagiocephaly different from craniosynostosis?